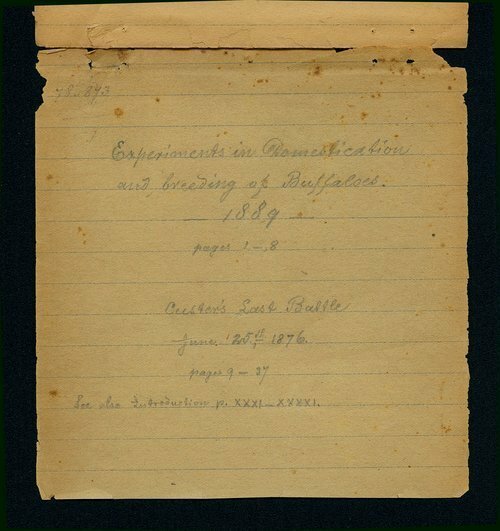 Written by Carl Julius Adolph "Ado" Hunnius, a collection of his thoughts on the subject of buffalo that would likely have been supported by his experiences in the U.S. Army during the American Civil War, as well as the Indian Wars that followed. Hunnius served as an enlisted man in the ranks that Custer and Hancock commanded during the 1867 campaign to pacify Native Indian tribes on the Great Plains. Call Number: Carl Julis Adolph Hunnius Coll. #397 Box 4, Folder: stories and essays, no. 5-9.